Reviews of silent film releases on home video. and the Silent Era Company. This first collaboration of director Tod Browning and actors Lon Chaney and Priscilla Dean set the tone for a number of crime films the trio would make at Universal. Versatile Dean is tough as nails as ‘The Gutter Rose’ and endearingly charming as the reformed Mary Stevens, waitress. Chaney is snarlingly menacing as ‘Stoop’ Connors, street tough. The film is unpredictable and entertaining. 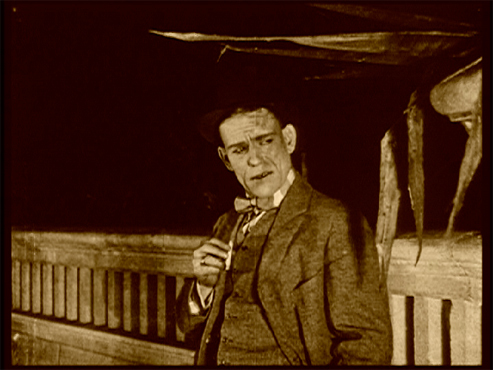 with The Wicked Darling (1919), color-toned black & white, 59 minutes, not rated. One single-sided, dual-layered, Region 0 NTSC DVD disc, 1.33:1 aspect ratio image in full-frame 4:3 (720 x 480 pixels) interlaced scan MPEG-2 format, ? Mbps average video bit rate, ? kbps audio bit rate, Dolby Digital 2.0 stereo sound, English language intertitles, no foreign language subtitles, chapter stops; standard DVD keepcase, $19.99. Release date: 25 January 2005. Ratings (1-10): video: 6 / audio: 6 / additional content: 8 / overall: 6. This DVD edition has been mastered from a duplicate 35mm print copied from the sole-surviving 35mm nitrate materials held by the EYE Film Instituut Nederland. The slightly-abridged print is significantly-damaged in places by mildew, which creates blotches of white speckling in the dark emulsion of the print, and by several splices and some sprocket-damage in the image area of the print, but remains watchable. The full-frame video transfer runs at slightly-faster than natural speed, and holds much of the print’s tonal range and image details. Some highlight details are blasted out and shadows are often closed-up, but not to the extent that is common in many reduction prints. Some brief sections of the transfer flutter back and forth quickly, twitching the film’s action, as if a few frames advance, move back and then forward again — all within about a half-second of time. Not worth mentioning for once, but it happens several times throughout the presentation. The digital video master substitutes the Dutch intertitles of the source print with English, following the original intertitles list in Universal’s corporate files. A few Dutch intertitles have been translated from the source print where they are missing from the documentation. Some fade-outs have been added in the transfer, and some flash frames of footage are represented by still frames in an attempt to retain the pacing of the scene and give viewers a chance to take in the surviving image. Missing footage is represented by black frames and is also bridged by expositional intertitles in an italicized typefont. The presentation features a passable music score, with a few sound effects, performed on synthesizers by Eric Beheim. Liner notes are by author Michael F. Blake. This moderately-priced disc is an excellent value for Chaney fans. USA: Click the logomark to purchase this Region 0 NTSC DVD edition from Amazon.com. Your purchase supports the Silent Era website. Canada: Click the logomark to purchase this Region 0 NTSC DVD edition from Amazon.ca. Your purchase supports the Silent Era website. Other silent era LON CHANEY films available on home video.